“Mass-produced documents” in a school district or business/organization is usually synonymous with “mass headaches.” If you want to keep copies of them for future reference or for legal reasons, that is – which most schools and businesses at least want to, if not need to, do. Think (for schools) report cards, standardized assessment test reports, and transcripts. For businesses, non-profit organizations, or other entities, think invoices, statements, shipping documents, donation letters/acknowledgements, or product recall notices – any document that is generated by the dozens, hundreds, or thousands. School districts are legally required to keep transcripts for a certain number of years, depending upon state regulations. For businesses or other entities, the document trail of, for instance, notifications and recall notices sent to customers may be not only convenient, it might also prevent (or help win) a lawsuit for the organization. The problem has been finding a cost- and labor-effective way of bridging the gap between generating the documents and filing the documents in each appropriate student or customer file. 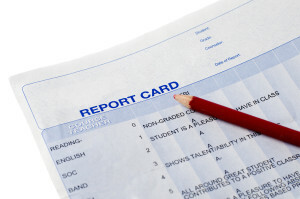 Take report cards, for example, in an average-sized school district of 4,500 students. That’s 4,500 report cards, generated 3-4 times per year – depending upon the marking period frequency. Eighteen thousand report cards per year that (in the past) needed to be printed, separated, and filed in each student’s cumulative folder. Why? Not every Student Information System (SIS) keeps copies of each report card for each student. Even if they did, school districts switch SISs from time to time – effectively losing access to documents stored in the previous SIS. Or what if you need to refer to documents when your SIS is down for maintenance or due to a problem? IdentiFile™ to the rescue! IdentiFile™ is a new technology released by Bull Valley Software for use in conjunction with our DocumentLOK™ document management system. With IdentiFile™, the large (usually PDF) file generated by your SIS or business system is “read”, and the necessary metadata is extracted for each report card, recall notice, or whatever. The gigantic PDF is then separated by student or customer (a process called bursting). The metadata is then used to file a copy of each unique report card (or other document) into each student’s (or customer’s) file – all without any human intervention. Those filed report cards or other documents are then linked back to the student or customer record within your SIS or business system – so you can access those documents again with one or two mouse clicks – and without ever leaving your SIS or business system! Now, how slick is that? Seriously, though, it really is. The amount of time that our users have told us they will save is insane. We’re not talking a couple hours here and there – we’re talking dozens of hours. Everyone who has seen it is excited about it. And so are we! To learn more about IdentiFile™ or DocumentLOK™, visit our web site at www.BullValleySoftware.com. To see either product in action, call us at (815) 788-1888, or email us at SalesAdmin@BullValleySoftware.com. Author Paul FotisPosted on June 27, 2016 Categories Bull Valley Software, Document Management, DocumentLOK, ECM, Enterprise Content Management, IdentiFileTags Bull Valley Software, Document Management, DocumentLOK, ECM, Enterprise Content Management, IdentiFileLeave a comment on IdentiFile to the Rescue!